The neighborhood of Mar Vista in Monterey is a small neighborhood of single family homes and condos situated to the east of Pebble Beach. 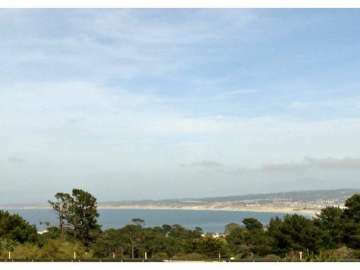 With its elevated perch, many homes offer views of the beautiful Monterey Bay. It is reached by travel on Hwy 68 by turning off for Skyline where the forested road will lead you to homes in a private tree lined setting. Mar Vista Drive is the main road traversing through the neighborhood, which is bordered by Via Paraiso to the west where Via Paraiso Park is located. With a picnic area, ball field and playground for children it is a peaceful place to enjoy a sunny afternoon. A great neighborhood for families, it is home to Walter Colton Middle School and belongs to the Monterey Unified School District. The acclaimed Stevenson School in Pebble Beach is also in within proximity and has an excellent academic reputation. For those seeking the convenience of condo living, Vista Del Mar is a condominium complex that offers two “villages” depending on desired floor plan and square footage. The Terrace has two bedroom units while The Grove has studios as well as one bedroom units. The complex is in a forested setting and many units have elevated views of the bay. There are monthly HOA dues with ownership in this complex. As of February 23rd, 2015 homes in the Mar Vista neighborhood range from a 1,154 SqFt home with 3 bedrooms and 2 bathrooms situated on a 18,800 SqFt lot and is listed for $659,000 to a 1,720 Sqft townhouse with 2 bedrooms, 2 bathrooms listed for $525,000. Click here to view all homes for sale in the Mar Vista neighborhood of Monterey. For all available Monterey real estate, click here. In 2014, 6 homes sold in this neighborhood. The most expensive home sold for $900,000 for a 3 bedroom, 2 bathroom home with 1, 154 SqFt of living space with Ocean views on a 13,939 SqFt lot. The least expensive home sold for $415,000 for a 3 bedroom, 2 bathroom home with 1,568 SqFt home on an 8,400 Sqft lot. In 2013, the most expensive home sold in the neighborhood was a 1,800 SqFt home situated on 6,000 SqFt of land, which sold for $835,000. The least expensive home sold in 2013 was a 1,600 SqFt home on 11,200 SqFt of land, which sold for $430,000. In 2012 there were 9 home sales in the neighborhood of Mar Vista. The most expensive home sold for $665,000 and was a 3 bedroom 3 bath home with 1,959 SqFt of living space on a 6,000 SqFt lot. Located on Mar Vista Drive, this home had views of the bay and mountains. The least expensive home sold for $340,000 and was a 4 bedroom 4 bath home with 1,837 SqFt of living space situated on a 6,300 SqFt lot on Via Del Pinar. This home was directly across the street from Quarry Park. For a detailed analysis of Monterey real estate sales, check out our monthly Community Market Reports. To live in the Mar Vista neighborhood is to enjoy a peaceful, quiet community of homes in a desirable and convenient location. Distant enough from the ocean to avoid the fog bank, the weather in this neighborhood is sunny and pleasant even in the summer when the coast experiences the thick coastal marine layer. With views of the Monterey Bay in the distance you are reminded of all the things to do and see on the peninsula. From water sports to cycling, hiking and kayaking your central location allows for easy access to endless opportunities for recreation. You will take advantage of your close proximity to Pebble Beach to enjoy the dramatic coastline and luxury resorts. From a picnic at the beach at sunset to cycling 17 Mile Drive it is a world class location to spend time. Golfers will love the abundance of golf courses including the famed Pebble Beach Golf Course, Spanish Bay Golf Links, Poppy Hills, Spyglass and more. A short drive south and you will arrive at Carmel-by-the-Sea, a story book town of charming cottages, oceanfront estates and shopping and dining along Ocean Avenue. It is also home to Carmel Beach, a beloved treasure of coastline with white sandy beaches and sparkling aqua surf. Of course, Monterey will be your home city to explore. Rich in history and character, you will visit Cannery Row, the Monterey Bay Aquarium, the Wharf, and beautiful parks too numerous to count. What a wonderfully convenient and peaceful neighborhood to call home.